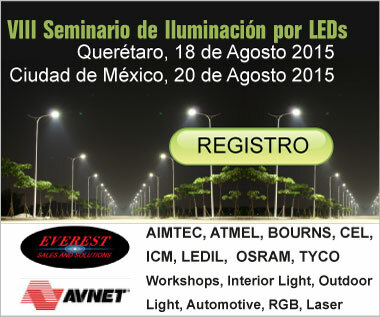 Join Everest Sales & Solutions and Avnet Electronics for the VIII Annual LED Illumination seminar. This years seminar will be held on 18 August 2015 in Queretaro, MX and 20 August 2015 in Mexico City, MX. Electronic component suppliers Aimtec, Atmel, Bourns, CEL, ICM, Ledil, OSRAM, and Tyco will present workshops on interior lighting design, outdoor lighting design, Automotive lighting design, RGB lighting, and Lasers in LED design.